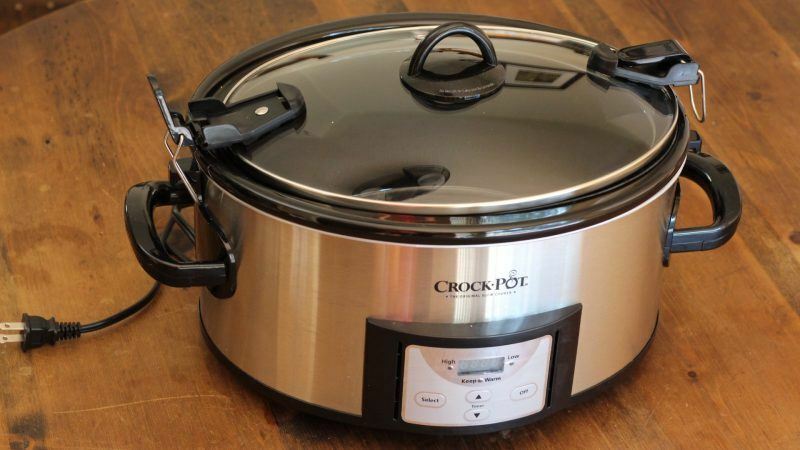 This name-brand slow cooker has a programmable digital control, which lets you select a high or low heat setting while inputting a cook time between thirty minutes and twenty hours using the thirty-minute interval of your choice. Once the selected cook time is up, the appliance automatically shifts to a keep-warm setting so your food remains at a ready-to-eat temperature throughout the evening. There’s an easy-to-use lid-locking feature so the cooker stays mess free even when you’re transporting the food-filled appliance. When it’s time to clean up, the stoneware crock and the lid can both be placed in the dishwasher. This user-friendly appliance can feed a large family and has amazing portability. Although the stoneware is oven and microwave safe, you shouldn't place the crock in the broiler or on the stovetop. Based on consumer reviews, the keep-warm function may be too warm for some dishes and will continue cooking your food. That being said, the appliance overall is well reviewed and is a best seller, making the cooker a perfect buy if you have typical culinary needs. 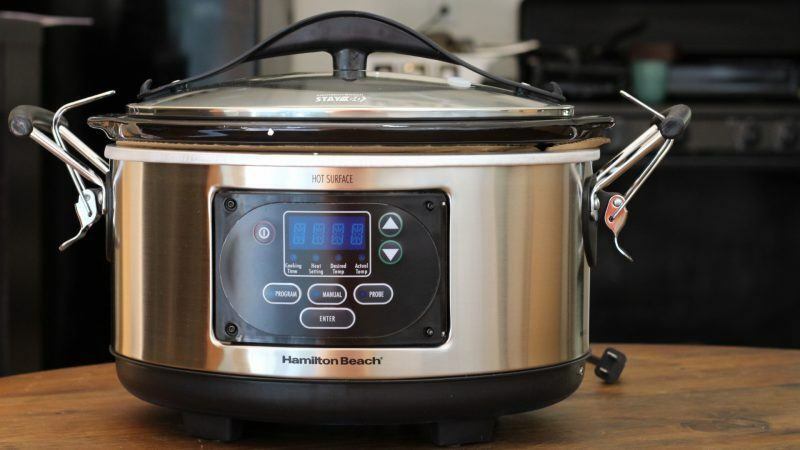 This savvy slow cooker from Hamilton Beach has three different cooking choices: probe, program and manual. When cooking meat, you can insert the probe and set the temperature, which will prompt the appliance to automatically shift to a keep-warm setting once the desired temperature is reached. Alternatively, you can program the cooker to stop cooking after a selected amount of time, after which the keep-warm setting will kick in. The third option is to manually turn the cooker on high, low or warm so you can turn off the appliance yourself whenever you deem the dish to be done. 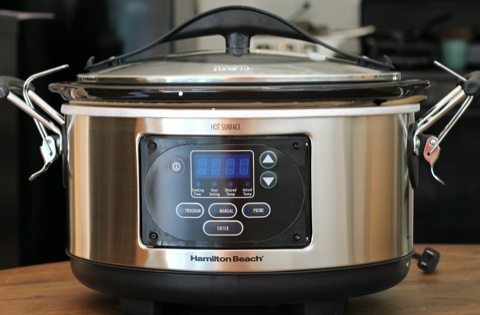 Hamilton Beach slow cookers are synonymous with reliability, but this particular model is especially useful since it comes equipped with protection against brief power outages. Although many programmable cookers shut off if the power supply is momentarily disrupted, this product actually stays on during brief interruptions so you can still come home to a hot meal. The model also has a clip-on spoon and a clip-tight gasket lid for extra convenience and security, adding to the many reasons why the Set ‘n Forget puts worrywarts at ease. 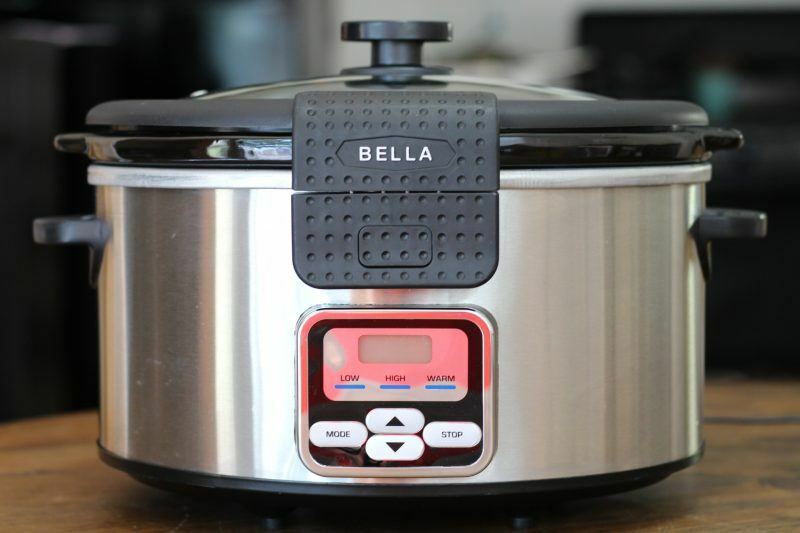 Here’s a multifaceted appliance that goes above and beyond the duties of a basic slow cooker. The oblong removable cooking pot can be used in the oven or on the stovetop and the base can be used as a griddle or warming tray. 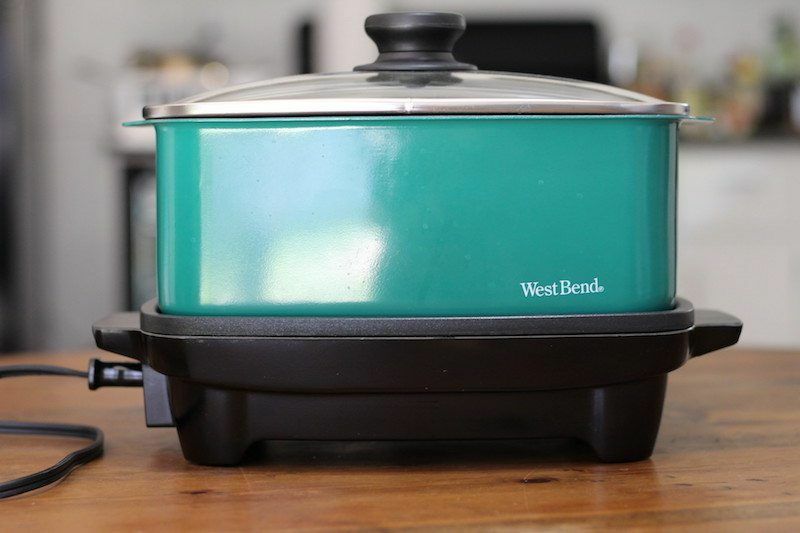 Of course, when used together, the six-quart pot and electrical base provide the slow-cooking functionality that warrants the product’s namesake. The programmable cooker can be set to warm, low or high for a customized amount of time. After the appointed cook time, the product will automatically switch to the setting of keep warm for up to twenty-four hours, at which point the appliance will automatically shut off. The sleek design of this versatile cooker is the gift that keeps on giving. The non-stick stainless steel pot, which can actually be stored in the fridge or freezer, and the glass cover are both dishwasher safe. 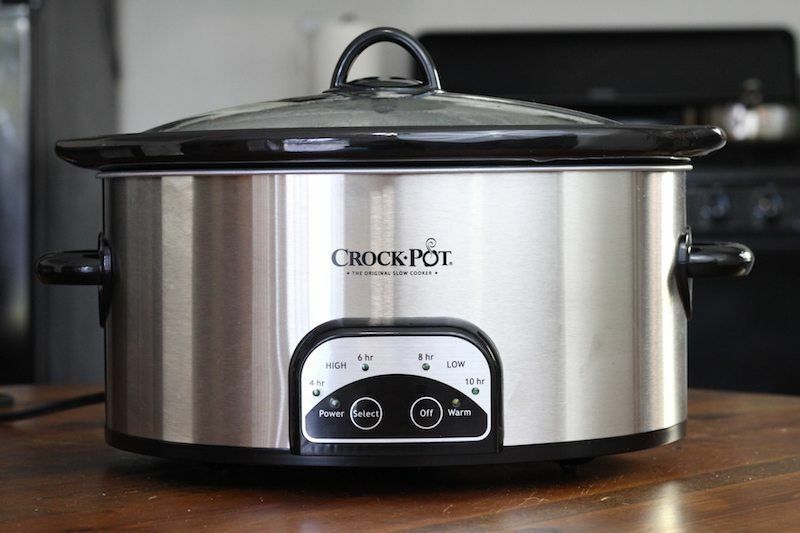 This model doesn’t have the look of a traditional crock-based slow cooker, but if that doesn’t bother you, then the added features are easy to fall in love with. I didn't review this specific model, but I reviewed a very similar one (different color, different model number). 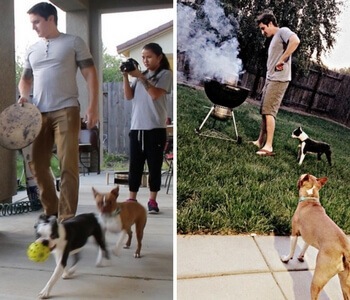 The capabilities and design were almost identical. The link below is to that review, and links to that cooker, but if you want to pick up this specific model the Amazon link below will take you to model 84905 featured above. With this appliance, you can heat food on high, low or warm for a selected amount of time, which is displayed on a digital countdown timer to remind you when the dish will be done. The lid has a secure lock feature for worry-free traveling and the lid also has a hinge that makes the cover stay conveniently upright when you’re serving. Additionally, the large crock comes with a built-in spoon rest and a matching spoon. Both the removable stoneware pot and the tempered-glass lid can be cleaned in the dishwasher. After the cook time, which can range from thirty minutes to twenty hours, is complete, the device will automatically turn off. Depending on your preferences, this auto-off feature may be a plus or a minus. If you’re worried about your dish overcooking while you’re away, it’s nice to have a model like this so you don’t have to deal with a keep-warm function kicking in and continuing to heat your meal for several more hours. On the other hand, if your cook time will finish two hours before you get home, dinner probably won’t be warm by the time you’re dishing up. If your personal tastes line up with the given features, this slow cooker has a lot going for it. This oval-shaped cooker has warm, low, medium and high settings as well as a programmable timer 4, 6, or 8 hours on each of said either low or high of cook time. The cool-touch handles and knobs keep your hands protected and the dishwasher-safe stoneware pot and tempered-glass lid keep cleanup a breeze. This is the six quart version of the 4-quart Smart Pot that ranked so well in the small slow cooker category! Some reviewers have mentioned that the “warm” setting runs a little hot, so if you plan to leave your meals cooking all day, keep that in mind. 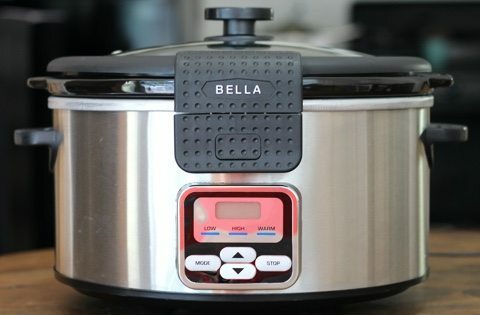 The slow cooker will automatically switch to warm after it's completed the cooking cycle, but you may need to do a few test trials of your recipes to account for how long the warm setting runs. There seems to be some negative reviews floating near the top, but they are from 2011. If you look at much more recent reviews they are pretty much all 5 stars, and of almost 200 reviews it's currently sitting at a 4.5/5! Note: The design and features of the 6 quart version are exactly the same as the 4 quart version, so I've linked you to that review below for now. I may purchase and test this model in the future, but for now that review should be enough for you to know if this is the type of appliance you want to buy. However, the Amazon link below leads to the six quart version you see pictured above! Unfortunately, there's no black version for six quarts like there is for the 4 quart style. Hope you like stainless steel! 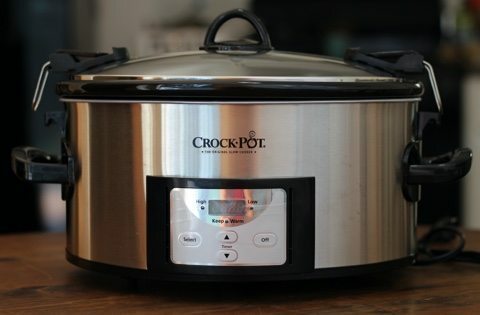 Since we have no complaints when it comes to the Crock Pot Cook and Carry model SCCPVL610-S, we have to nominate this model for the best slow cooker with a mid-range price tag. The six-quart capacity is great when cooking for a family or a small group of friends and the three different cooking choices provide much-needed flexibility based on your changing circumstances. Made by a home-appliance brand we love, and one that sits on our #1 spot for many lists, the 6-quart Cook and Carry can be a valuable asset in any kitchen. Once you dive into the world of slow cooking, you may never go back. After making soups and stews of all varieties, you’ll likely be seduced by slow-cooked appetizers like bean dips and meatballs in addition to side dishes such as mashed potatoes and creamed corn as well as desserts like bread pudding and apple cobbler. Regardless of what types of foods you like to eat or need to avoid, a slow cooker can keep your diet on track in an easy yet mouthwatering way.